While waiting for AB YACHTS to launch their 98, 116 and 140 footers, the 92' model maintains its position as the yard's "flag" ship. 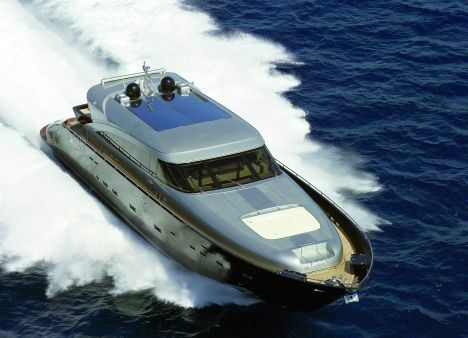 She's a cruiser that doesn't just look sporty because each of her two 2.400 HP MTU engines, coupled to the Rolls Royce Kamewa hydro-jet thrusters, sees to her performance enabling her to reach a declared top speed of 50 knots. Should that not prove to be fast enough, fitting the AB 92' with three 1.825 HP CAT engines, should do the trick. Distribution of the space on board is rational and not extravagant. Below deck there are four cabins plus separate crew quarters for two seamen. The owner's master cabin at full beam of the centre of the yacht is complete of a walk in wardrobe, an en-suite bathroom, a corner to relax in, and a desk with a seat to match. Three cabins with en-suites are reserved for guests. The centre one is a single with the berth fastened to the underlying floor , one of the two cabins, towards the bows, is a vip cabin whilst the other has two separate berths. In between the owner's stateroom and the guest area there's a small saloon, a sofa and wardrobe. The areas in common are on the main deck which sports the main saloon with sofas to starboard and the dining area on the opposite side whilst at the bows, the wheelhouse, terrace like, looks over the lower deck. Externally, the large sunbathing area at the bows matches the one in the cockpit which with its sofa and bar cabinet ensures an enjoyable cruise in total comfort. The tender is allocated inside the hanger and is accessed from the stern. A few more words ought to be spent on the design and technical compartment, therefore it should be noted that, as far as the exteriors go, the AB92' has the same general lines of the AB series with the consequent well balanced result. The yard chose to furnish the interiors with substantial use of ultra light composite material, covered, to enhance its appearance, with sheets of different precious essences and so as to ensure maximum comfort at sea, to deploy elastic supports for the flooring below deck, which is also made in composite material.